We offer an amazing selection of luxury wine and Champagne gifts for all occasions. 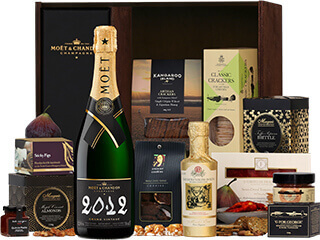 Over the last 12 month we have sourced some sensational hampers that have been packed full of amazing gourmet treats and of course fine wines and Champagne. From Luxury Chocolate and Champagne to Red Wine and Nibbles, we firmly believe that we offer some of the finest hampers available. 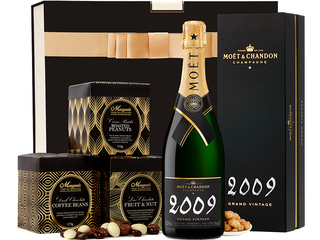 Premium Birthday Hampers with Wine & Champagne to Fit Your Recipient! At the Hamper Emporium, customers can find countless birthday hampers with lovely wines and champagnes; this includes our entire collection of wine and champagne gift baskets. If you need a birthday hamper for your recipient, you cannot go wrong by choosing an exquisite birthday hamper from this collection. Curious why? Check out the information below to find out. Why Are Champagnes and Wines Suitable Items for a Birthday Hamper? Champagne and wine hampers are classic and traditional gifts, suitable for any type of celebration or gathering with friends, family, or even business clients. 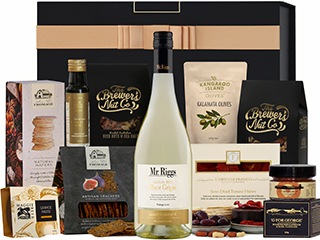 Our gift hampers contain award-winning Australian wines and French champagnes with equally delectable gourmet treats such as truffles, chocolates, cookies, crackers, dips and other tasty nibbles, as well as spices, seasonings and marinades to make meals and wine tastings extra special. We have gift hampers that are sized just right for small intimate occasions, as well as large parties. Our wine and champagne gift hampers come packaged in either luxury keepsake boxes or rustic wooden boxes, which are all finished with a stunning, decorative ribbon. We also provide a beautifully woven basket for our popular Premium Office Share Gift Basket, which holds two bottles of wine; a Pinot Noir and a Pinot Grigio, from the cellars of Brown Brothers. 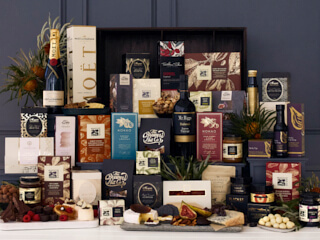 It also has over three dozen gourmet treats from international luxury brands like Baru of Belgium; Butlers Chocolates of Ireland; Vivani Organic Chocolate of Germany; Le Cordon Bleu and Maison Fossier of France; and home-grown Australian favourites like Nougat Limar, Morgan & Albert’s, Baylies and Valley Produce Company. This premium gift basket has plenty of treats to satisfy any palate and is perfect for office birthday parties and other celebrations. Aside from birthdays, champagne and wine hampers also make impressive corporate gifts. What Are Champagne and Wine Birthday Hampers? If you require something a bit simpler yet still equally exquisite, we have quite a few Champagne hampers to choose from. 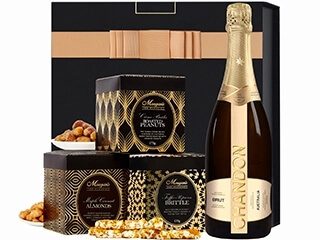 The Chocolates and Champagne Gift Hamper, which is one of our more affordable and popular options, contains Piper-Heidsieck’s Cuvee Brut and an assortment of Butlers Premium Handmade Chocolates. Piper-Heidsieck was founded in 1785 in Reims, France and is known worldwide for both its prestige and non-vintage Champagnes. 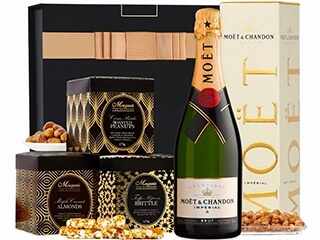 The Luxury Chocolate and Champagne Hamper includes a bottle of Veuve Clicquot’s famous Yellow Label Champagne, assorted Butlers chocolates, candied peanuts from Morgan & Albert’s, as well as French pastries from Mason Fossier. 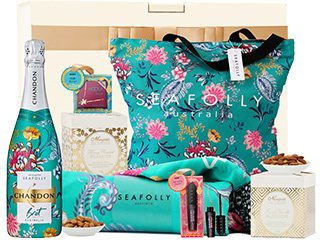 Another option is the Luxury Hamper which adds even more luxury items from Australia’s MOR Cosmetics, such as a fragrance diffuser, body products, complemented by a box of Sweet Rose Tulsi Tea from Organic India. It also includes Belgian chocolate bars from Dolfin. 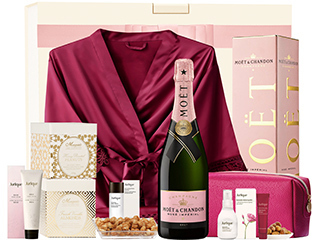 Finally, the Pure Indulgence Hamper is one of our gift hampers that includes a bottle of Moet & Chandon’s Brut Imperial Diamond Suit Brut Champagne. Moet & Chandon is one of the world’s largest and most recognized champagne producers. 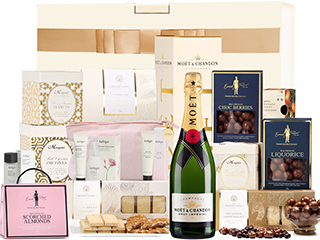 It also has an assortment of products from MOR Cosmetics, Maison Fossier and Butlers Chocolates like our other luxury champagne hampers, as well as chocolates from Willie’s Cacao of Venezuela and Hamlet of Belgium. A great bottle of wine is a versatile gift for any occasion, but there are just so many varieties to choose from that makes it difficult to tell the good from the bad. We’ve chosen some amazing red and white wines for our gift hampers and paired them with a great selection of gourmet food to make your gift even more memorable. People on a budget don’t have to settle for a cheap bottle of wine. Our most inexpensive wine gift hampers come with either a bottle of red or white wine from Devil’s Corner Winery of Tasmania. 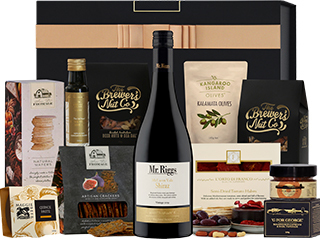 The Red Wine & Nibbles Hamper includes a bottle of Pinot Noir, as well as Baylies gourmet crackers and lavash; Morgan & Albert’s relishes and salted pistachios; and fruit pastes, cracker thins and seed crisps from Valley Produce, which all make an excellent combination. For a more diverse selection of tasty nibbles and seasonings, we offer The Best of All Gourmet Hamper, which contains the most delightful nibbles and wines. It has a fabulous terrine from Comtesse Du Barry and a jar of olive spread from Le Cordon Bleu of France; extra virgin olive oil from Portofino and truffle sauce from Tartufi Morra sourced from Italy; an exquisite prune and walnut log from Pastilla Nash and other epicurean delights from Baylies. make celebrations even more festive over this Christmas season. Customers looking for exquisite champagne gifts do not have to look far on the Hamper Emporium, because many of our gift hampers contain a fine bottle of champagne. 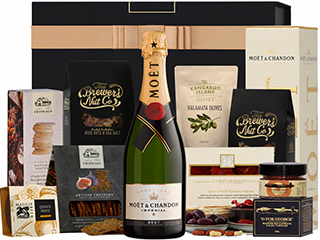 We even provide gift hampers that only contain the finest French champagnes, so if you are looking to buy for a champagne collector or connoisseur, our range of gift hampers will always have a suitable option available. As mentioned earlier, our extensive range of champagne hampers features some of France’s finest champagne labels. Therefore, customers may come across champagnes from champagne houses such as Veuve Clicquot, Moet & Chandon, Bollinger and Piper-Heidsieck. In addition to that, our range also contains numerous sparkling wines from Australia’s finest wineries, which includes Brown Brothers. Still, our range of gift hampers does not stop with champagne, because our valued customers can also count on other alcoholic beverages from Glenlivet, Glenmorangie, Robert Oatley and many others. So, if your recipient likes to collect the best alcoholic beverage in the world, be sure to have a look in our gift hampers range today! Could I Use the Champagne and Wine Hampers from the Hamper Emporium as Thank You Hampers? Our champagne and wine hampers are excellent choices for birthdays, but also to say, “thank you”. 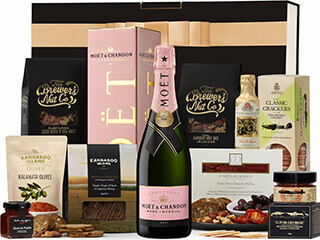 If you need an exquisite thank you hamper, you simply cannot go wrong by choosing one of the champagne and wine hampers from the Hamper Emporium. A combination of champagne, wine, or gourmet treats always provides the best option when it comes to thanking someone. 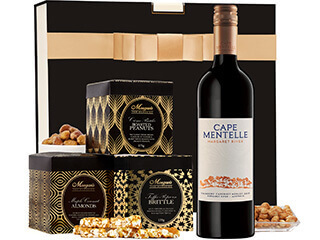 Therefore, you will find that most of our recommended thank you hampers include this crucial combination of wine, champagne, and gourmet nibbles. Still, if you are looking for another thank you hamper, be sure to check out the additional options in our collection. You can also contact the Hamper Emporium team for a good thank you hamper recommendation.